There is no other color like the color red for maximum impact appeal! The color red appears to advance towards you while making all other colors in the room retreat. If one says “Red” – the name of a colour – and there are fifty people listening, it can be expected that there will be fifty reds in their minds. And one can be sure that all these reds will be very different. And now for some red walled bedroom inspiration! Pull one statement-making color out of a bedspread fabric for the wall color to get an unforgettable look. Here, candy-apple-red walls are bold and in control. For eye-catching artwork, paint empty picture frames white and place them on the wall above the bedframe. The white pops against the red, adding interesting contrast to the walls. Red Baroque bedroom with walls painted in a bold Craig & Rose shade are offset with chunky French-style carved pine furniture and a gold mirror to make a strong statement in this bedroom. 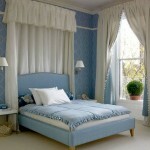 Light-coloured decorative curtains, carpet and bedding prevent the room from being too overbearing. A bedroom has been transformed into a cosy haven with rich ruby red walls and a matching throw and cushions. A striking palm-leaf cushion gives the room a modern feel. Pretty candles and brass accessories, like the lamp, complete the warm and inviting look. In this Oriental-inspired bedroom one wall is painted in bold red, which adds depth to this neutral scheme. Pale wooden furniture blends into the caramel-coloured walls and carefully placed accessories and the orchid bed linen from Next completes the look. All that’s old is new again when spruced up with color and the appropriate comforts. This dark Gustavian-tyle bed from Viva Terra Here is made from reclaimed fir and is an ideal compliment to Benjamin Moore’s Vibrant Blush, a rich stain on the surrounding walls. Blue and white bedding soften the room, and stitched throw pillows add a handcrafted feel. Sheets and pillowcases in orange and purple are enough to raise the temperature in this room and the red walls take it to the next level! This bedroom is sure to give you rosy cheeks. A lovely red bedroom wall combined with damask throw pillows on the bed for pure perfection! Make a cushioned headboard from different prints and textiles. Pick fabrics in coordinated colours to cover nine cushions that can be fixed together to a plyboard backing, and get an expert to assemble for you. This entry was posted on Saturday, May 28th, 2011 at 10:57 am	and is filed under Bedrooms, Red. You can follow any comments to this entry through the RSS 2.0 feed. You can leave a comment, or trackback.